Last update: 10 December 2011: Game package of limited edition disk. Also, soundtrack announced and orders open! 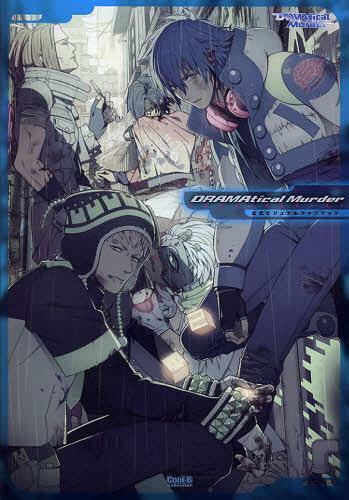 Relationship chart from DRAMAtical Murder INSTALL BOOK from Nitro+Chiral’s comiket 81 set. Aoba’s allmate. In the form of a dog. Koujaku’s allmate. In the form of a sparrow. Mink’s allmate. In the form of a parrot. I’m listing only the ones that includes store tokutens. I’ll update when more stores are announced. Set slightly before the time period in the game. Each character’s story before they got to know Aoba. Virus and Trip may be gangsters yakuza on Midori Jima 碧島, but what do they usually do every day? Drama CD is about their daily activites. Beni picked up a piece of paper and the “all mates” chit chat about a mutual master. Will they also reveal the secrets about it? All four short stories published in 「Cool-B」 magazine will be recorded! A more detailed coverage of the character characters will be published in the next issue of Cool-B Magazine (right). Nitro+Chiral will also be showing the Demo movie of the game during Comiket 79 event (coming this 29-31 December 2010) as well as sell related game goods :) So we may be seeing this game much earlier than we think ^^ Clever of them to continue the ride on the Togainu no Chi anime publicity wave. They have also engaged a new illustrator Honyarara (ほにゃらら) as well. The style of the character silhouette looks very different from that of Sweet Pool illustrator Onizuka Seiji. I wonder when it’ll be launched… they usually start promoting a game at least 6 months before launch, so my guess is sometime from June 2011 to December 2011.